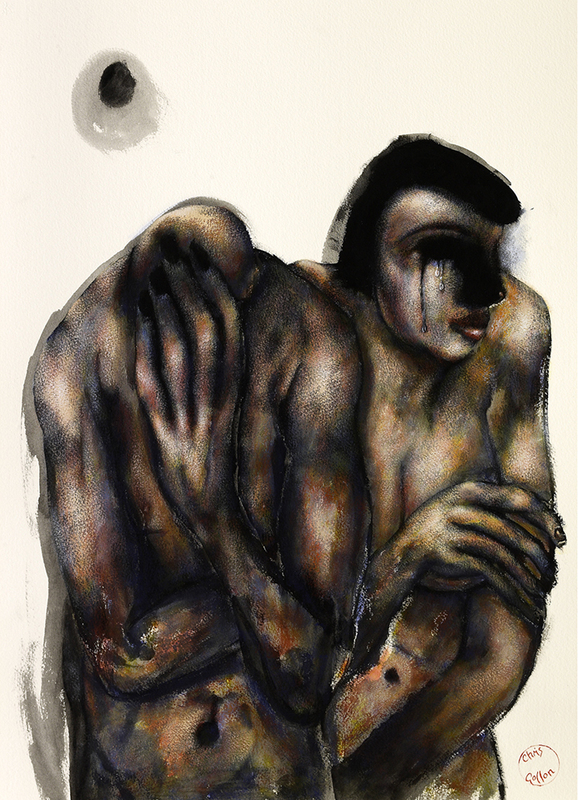 30″ x 22″ (76 x 56cm) acrylic on paper 2013. Purchased by the collection of the University of East Anglia for its new Julian Study Centre. 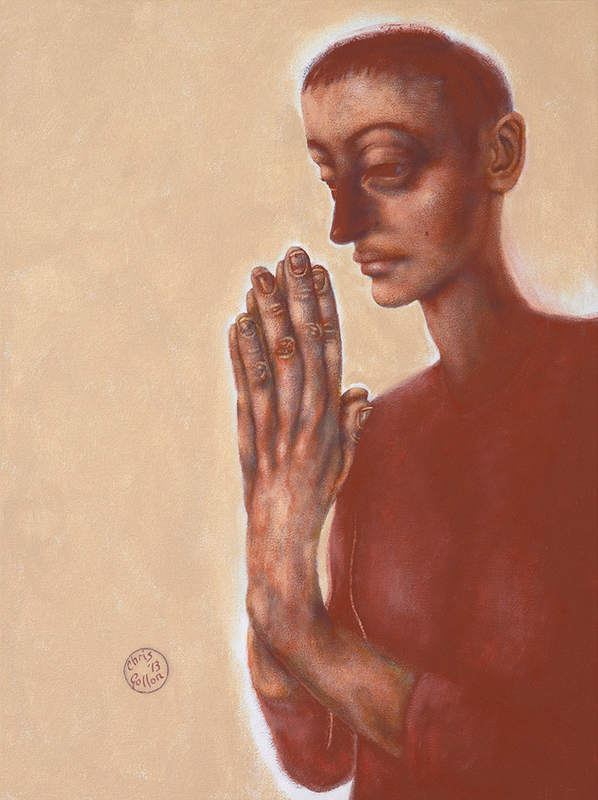 This series of religious imagery (see Collections page to view all) explored the experiences of women in the Bible and began as a collection of seventeen paintings for a solo exhibition at Guildford Cathedral, in Chris Gollon’s home county of Surrey. Chris Gollon and Sara Maitland attended the private view. The exhibition was accompanied by a full-colour catalogue with texts by award-winning novelist Sara Maitland, art historian and writer Tamsin Pickeral; the Revd Canon Dr Andrew Bishop and theologian Canon Dr Julie Gittoes. 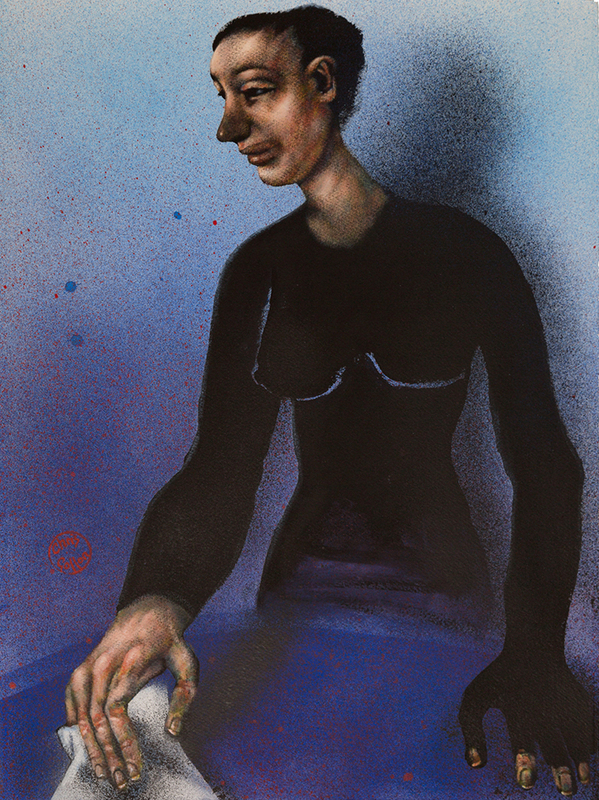 The exhibition caught the attention of the public and media nationally and become noted for its thought-provoking and innovative depictions of women. Such was public and press response, it then snowballed to become a national touring exhibition to English cathedrals in 2015, touring to the cathedrals of Norwich, Chichester, Durham and Hereford. In autumn 2016, to coincide with the festival of St Ethelflaeda it travelled to Romsey Abbey. The first seventeen paintings shown at Guildford Cathedral remained the core of the exhibition and appeared in the catalogue. 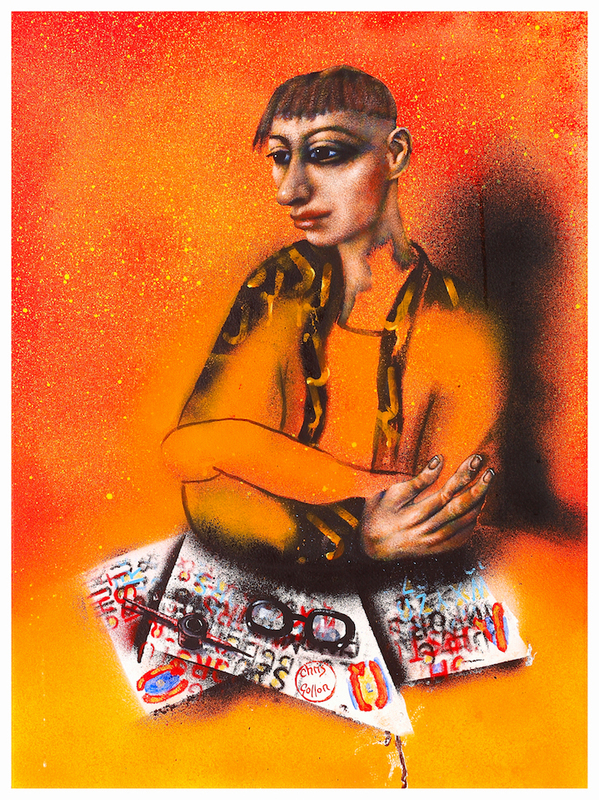 However, to vary the exhibition at each subsequent cathedral Chris Gollon added new works. At Norwich Cathedral, after conversations with Canon Librarian Dr Peter Doll about how Mary had been viewed as a second Eve, he decided to exhibit his ‘Madonna of the Apple’, which he had painted in 2012 but never exhibited. 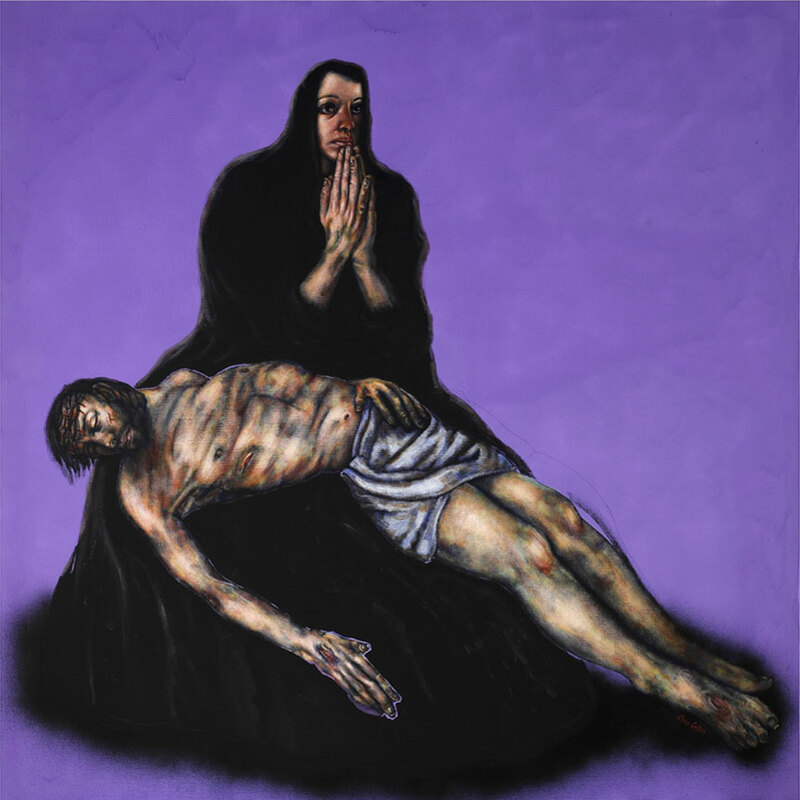 For Chichester, having just read Carol Ann Duffy’s ‘The World’s Wife’ and following a conversation with Canon Chancellor Dr Anthony Cane, Chris Gollon became the first artist in history to paint Judas Iscariot’s wife. 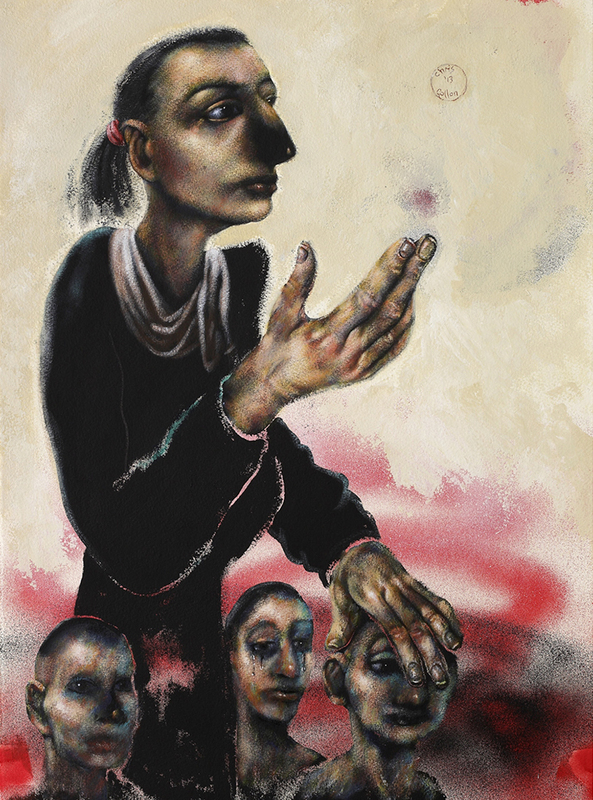 Unveiled at Chichester, Gollon’s painting ‘Judas’ Wife’ attracted much national media attention, since he chose not to imagine her as a money-grabbing woman just after the 30 pieces of silver, as depicted in early Christian writings; but rather as a woman imploding with grief as she grasps in one hand her husband’s suicide note, while also hearing news of the forthcoming Crucifixion. BBC broadcaster Clare Balding while interviewing Chris Gollon suggested he had managed to depict the sheer swollenness of grief, to which he replied “yes, she is almost beyond grief”. 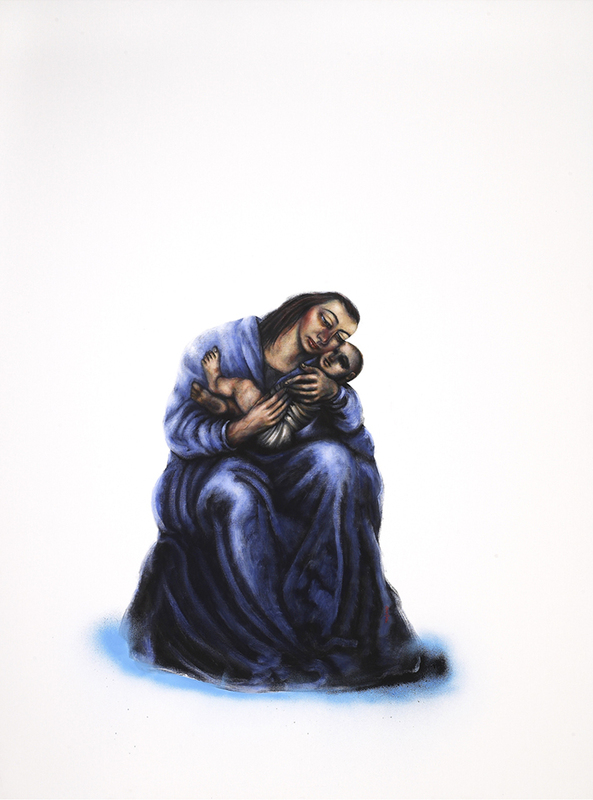 The first image of Judas’s Wife was in acrylic on paper. He then painted two more images of the subject in oil on canvas and acrylic on canvas. o see a national television interview with Chris Gollon regarding this image at Chichester Cathedral, click the first film here: Films .